Actors Terry O'Quinn and Michael Emerson are teaming up again. "Lost" fans may have a new dial to switch to in the coming months to see some familiar island faces together again. A rep for NBC confirmed to Access Hollywood on Wednesday night that the reports are true — the Peacock network has secured the rights to the upcoming J.J. Abrams show starring former "Lost" co-stars Michael Emerson and Terry O'Quinn. According to New York Magazine's Vulture blog, which first reported the news, the currently untitled program has "Alias" alumni — Josh Appelbaum and Andreme Nemec – writing and executive producing. Additionally, Abrams and another "Alias" alumnus, Andre Nemec are executive producers. "I'm thrilled to be involved with Warner Bros., J.J. Abrams, Bad Robot, NBC and the incredible team of Josh Appelbaum and Andre Nemec on this new venture," Michael said in a statement to Access Hollywood on Wednesday night. "I'm absolutely delighted to be given the chance to work with Terry [O'Quinn] once again, and we're all very excited to get started." The show, described as a comedic drama by Vulture, would likely see the two actors starring as ex-black-ops agents. Vulture reported that NBC has "commited" to a pilot of the program. 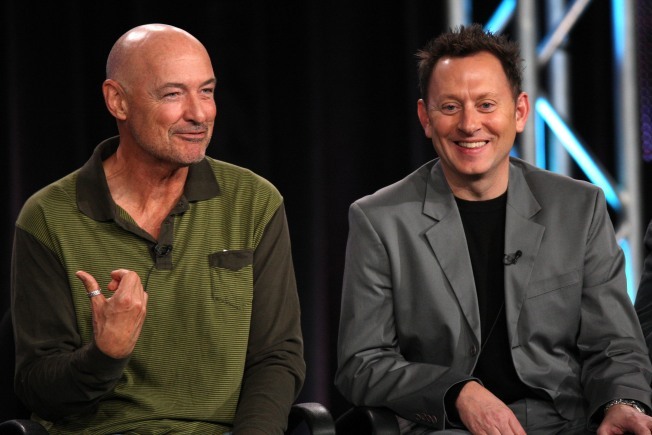 Michael, who played Ben Linus on "Lost," told AccessHollywood.com in May that he and pal Terry, who played John Locke (and later, the smoke monster) on the ABC show, had come up with a host of television ideas to keep them working together. "We've been joking for a long time about what we ought to do together when this is all over — stuff like we were gonna do a play on the front porch of the old actors home, you know that kind of thing — just jokes," Michael previously told Access. "But Terry had a couple of really good, strong ideas and he pitched them to someone in the world of producers and they seem to respond to it. So I don't know where it's at or whether it will come true, but there's a good idea out there kicking around and if it comes to life, it would make me very happy." Michael added that he and Terry became good pals on the "Lost" set, the result of several seasons of being paired opposite each other in dozens of scenes. "We were close and we had many days where it was he and I working together and those days were great working days, some of the best of my career," Michael said at the time.